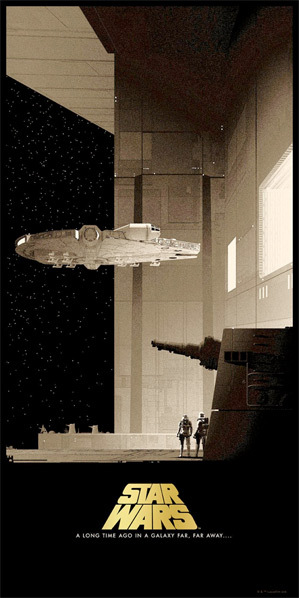 Return to a Galaxy Far, Far Away… to buy yet another set of stunning posters for the original Star Wars saga! 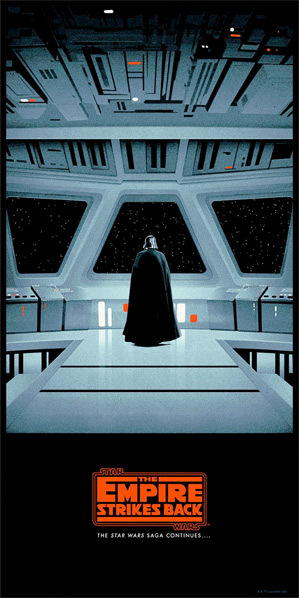 Brooklyn-based Bottleneck Gallery is launching another series of screen prints, this set by Matt Ferguson, for the original Star Wars saga in a timed sale on their website this weekend. We’ve featured a whole bunch of different Star Wars art over the last year, since everyone is in a very nostalgic mood with the new movie playing in theaters. This latest set is by an artist we’ve been following for a long time, known as “Cakes and Comics” – last year he did the Lord of the Rings trilogy, this year we get Star Wars. Take a look. This series of Star Wars prints will go on sale starting at 12PM ET on Thursday, February 25th. 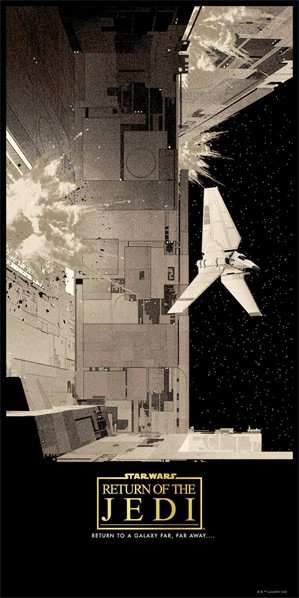 The screen prints are 12″x24″ in size and cost $100 for the complete set, or $115 for the gold variant versions. You can buy these from Bottleneck Gallery by clicking here. There will only be 225 of the gold variant versions sold, however the regular set is available in a timed release. You can order a copy anytime you want from today until the end of the day on Sunday, February 28th. For more art by Matt Ferguson, visit his official website. Other recent artwork related to Star Wars we’ve featured includes this noir series by Marko Manev, Gabz’s original trilogy triptych series, Eric Tan’s Star Wars trilogy set, and this Star Wars-themed Last Supper art. 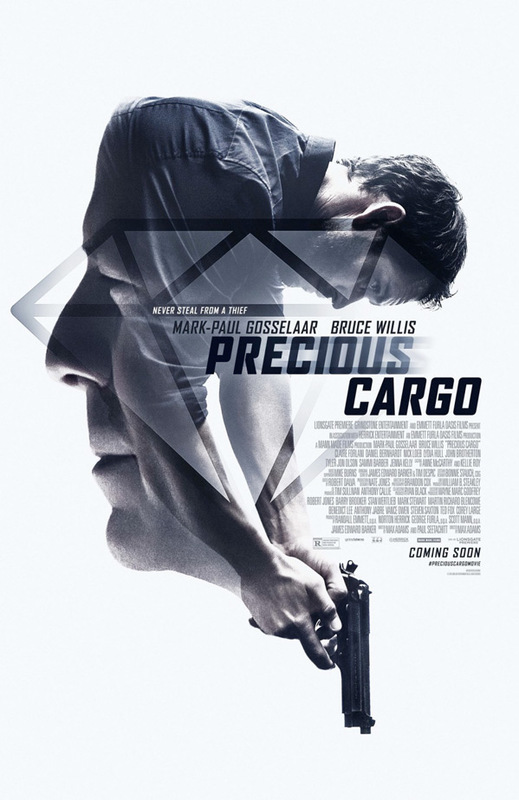 “Sometimes things just don’t work out.” Lionsgate has debuted a trailer for the action-packed heist thriller Precious Cargo, directed by Max Adams, starring Bruce Willis as the villain. He plays a crime boss who hires a thief but then double crosses him and then gets tangled up in a big showdown. There’s lots of action, it looks pretty good if you just want to see some solid action, but I’m not sure about the rest of it. The full cast includes Mark-Paul Gosselaar, Claire Forlani, John Brotherton, Lydia Hull, Daniel Bernhardt, Ashley Kirk and Nick Loeb. I hope this is actually as fun as the trailer makes it look. Enjoy. After a botched heist, Eddie (Bruce Willis), a murderous crime boss, hunts down the seductive thief Karen (Claire Forlani) who failed him. In order to win back Eddie’s trust, Karen recruits her ex-lover and premier thief Jack (Mark-Paul Gosselaar) to steal a cargo of rare precious gems. But when the job goes down, allegiances are betrayed and lines are crossed as Jack, Karen, and Eddie face off in a fateful showdown. Precious Cargo is directed by American filmmaker Max Adams, making his directorial debut after a few shorts previously. Adams also served in Operation Iraqi Freedom (the Iraq War). The screenplay is written by Paul V. Seetachitt and Max Adams. Lionsgate & Grindstone will release Precious Cargo in theaters + on VOD starting April 22nd this spring. For more info visit Lionsgate.com. Anyone interested? “Some programmer screwed up somewhere.” Vertigo Films has released the first trailer for Steven Gomez’s Kill Command, a science fiction horror thriller about man eating machines pitted against helpless humans – pretty much. The film stars English actress Vanessa Kirby as some kind of cyborg, Danish actor Thure Lindhardt, plus David Ajala, Tom McKay, Bentley Kalu and Mike Noble as an elite unit of Marines that goes in for an exercise and discovers they’re in for a death match with some very creepy, nasty robots. This looks kind of awesome! I’m actually looking forward to seeing this, nice surprise sci-fi discovery. The VFX are impressive – I’m kinda creeped out. Everything about it looks solid, might be entertaining. Identify! Kill Command is a sci-fi action thriller set in a near future, technology-reliant society that pits man against killing machines. Against this backdrop an elite army unit is helicoptered to a remote, off-the-grid island training facility. What starts out as a simple training exercise for Captain Bukes and his tight-knit unit, descends into a terrifying battle to the death, as the marines discover the island is overrun by an enemy that transcends the human concept of evil. 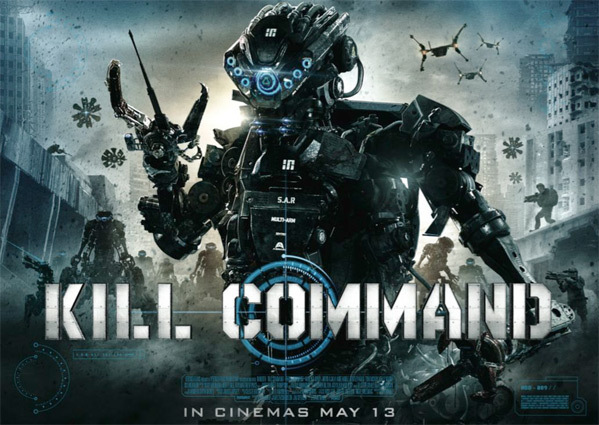 Kill Command is both written and directed by Steven Gomez, making his feature directing debut after a short film called Drip in 1996. The film doesn’t have a US release date set yet, but will open in Europe over the next few months, including in the UK on May 13th. Stay tuned for more release updates in the US. For extra info, check outt Protagonist Films. Your thoughts?